Fresh off unveiling their take on a reborn Ferrari F40 with the N-Largo 488 GTB, the mad scientists at Novitec are turning their widebody wizardry on Maranello's domestic rivals. We've all seen what the Lamborghini Huracan can do when it's blessed with over 2,000 horsepower and room to run, but the German tuning house didn't set out to create a half-mile monster with the Spyder. Instead, what we've got here is a curvaceous, drop-top, badass bruiser. 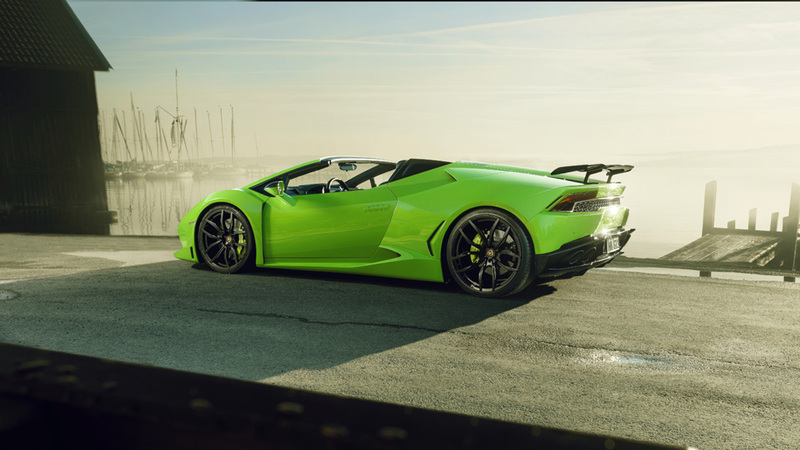 In our eyes, the Novitec N-Largo Huracan Spyder is basically how the regular Huracan should have come from Lamborghini's factory. From the new aggressive front bumper to the widebody fenders to the supercharged 5.2-liter V-10, Novitec's upgrades successfully toe the line between restrained and batshit without hedging too far in either direction—just like Sant'Agata Bolognese used to make its supercars. 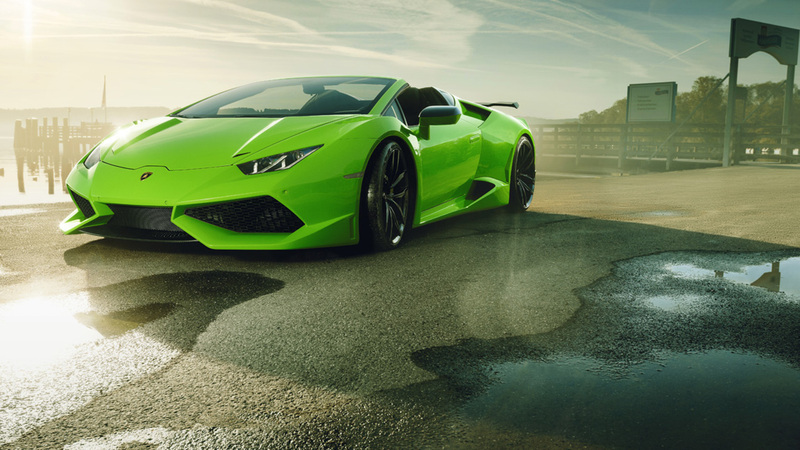 The impending Lamborghini Huracan Performante is a big step in the right direction for the company, but that's still a few months out, and the convertible even further away. Starting in the front, the new bumper purportedly reduces front axle lift to sharpen up the steering. Those beefy front fenders add about 2.4 inches of total width and feature special three-slot vents to increase airflow to the front brakes. The midsection of the car is left at its stock width, but the rocker panels are redesigned to incorporate more cooling vents for the rear brakes. 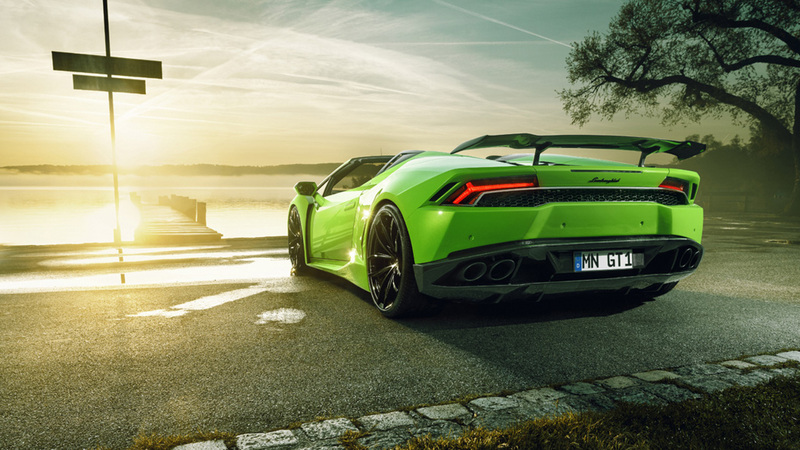 Meanwhile, the bulging rear fenders are almost a full five inches wider than a normal Huracan, finishing off the car's hourglass shape. There are a host of optional naked carbon fiber accent pieces available, but the upgrades go beyond cosmetics. A 1.4-inch suspension drop and staggered 20/21 inch front-and-back wheel sizes further tightens up the handling, but the real magic is under the hood. While it may seem sacrilege to some to supercharge one of the last great naturally-aspirated engines out there, it's hard to argue with 860 horsepower and 709 lb-ft of torque. We don't have any performance numbers yet, but throw in an optional lightweight Inconel exhaust derived from Formula One cars, and you've got yourself something close to a world-beater. 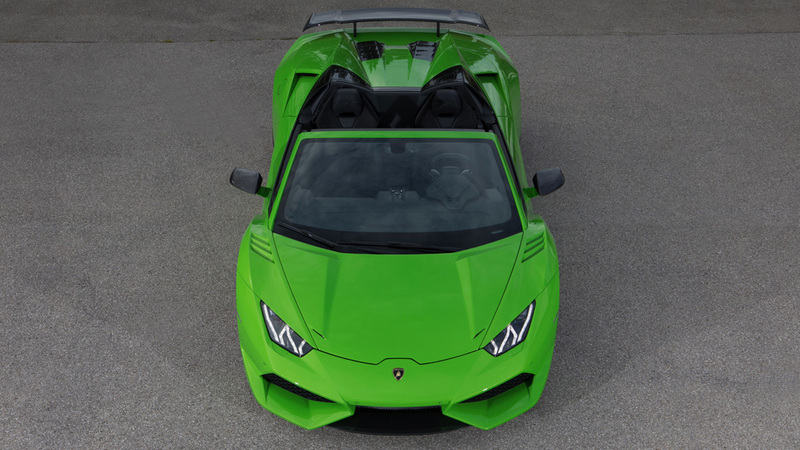 Like every other awesome limited edition Novitec job, the N-Largo Huracan Spyder is being built in minuscule numbers—just 11 convertibles finished in brilliant Verde Mantis will be produced for the lucky few with enough scratch to snap one up. That's probably not you, unfortunately, but you can still gawk with the rest of us.